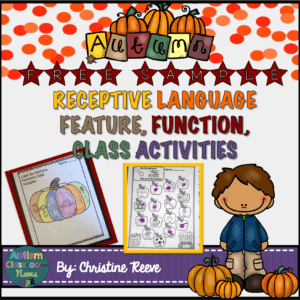 This post is a combination of two of my favorite things–autism activities and autumn. 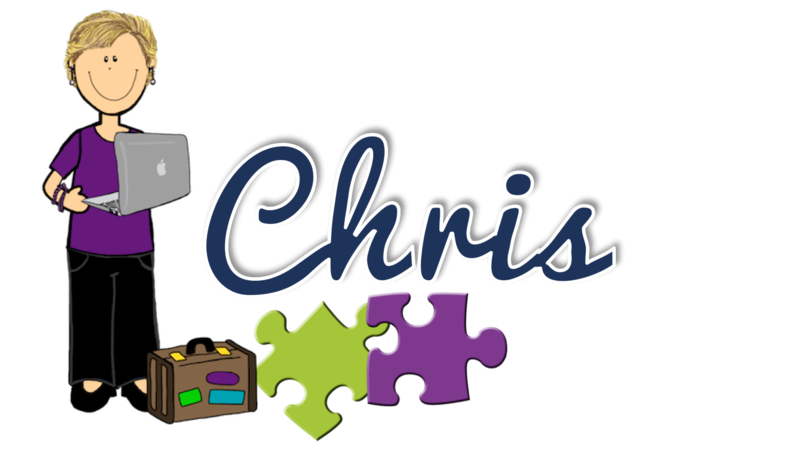 I think I’ve proven over time that I love activities for autism, making them, using them, etc. Sometimes I think people don’t realize just how many activities you need for some of our more complex learners. Just because they take more time to learn some skills does not mean you use fewer activities–in fact it’s the opposite. Keeping students who have limited independent skills and benefit from high levels of activities need LOTS of activities to keep them engaged. In addition, if you use the same materials over and over for such a long time, both the student and the instructor are going to be bored…and boring instruction leads to frustration by both parties. I’ll never forget a middle schooler I worked with when we didn’t have time to make multiples of work tasks for his work system, so the afternoon system had the same activities as morning one (just for that day, I promise!). He got to the work system in the afternoon and said, “I already did this.” I said “I know, but can you try it again for me”–after all he hadn’t been completely independent in the system so he still needed the practice in independence. His reply? “But I already did this” with this incredulous tone in his voice like he couldn’t believe I didn’t understand. I asked again and eventually he did them, but he did the system slamming the bins around saying, “I. Already. Did. This!” And he was right–it wasn’t right of us to ask him to do it again. We had just been setting up a classroom with limited time and didn’t create enough tasks to keep up with him. Takeaway lesson for me–you need LOTS of materials! You need more, not less, activities for complex learners to keep them engaged. And for this reason I feel like you need even more activities and I love seasonal activities because you can have the students practice the same skills with different materials–and they don’t realize they are working on the same stuff! My second love is fall. I grew up in Florida and with the exception of the 10 to 12 years I escaped from it, I have lived here most of my life. This is relevant because we don’t really have fall. I was in college before I saw leaves change. Seriously. As a consequence, I love everything fall–except oddly Pumpkin Lattes-disagree with me in the comments! I love the cool air, the leaves, the smell, the apples, the pumpkins….you see how this is going. 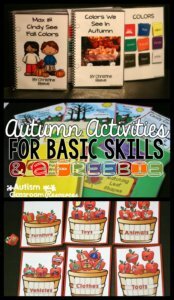 If you have students who need basic skills for academics, these fall folders are good for practicing matching numbers, filling in missing numbers, and matching quantity to numbers. 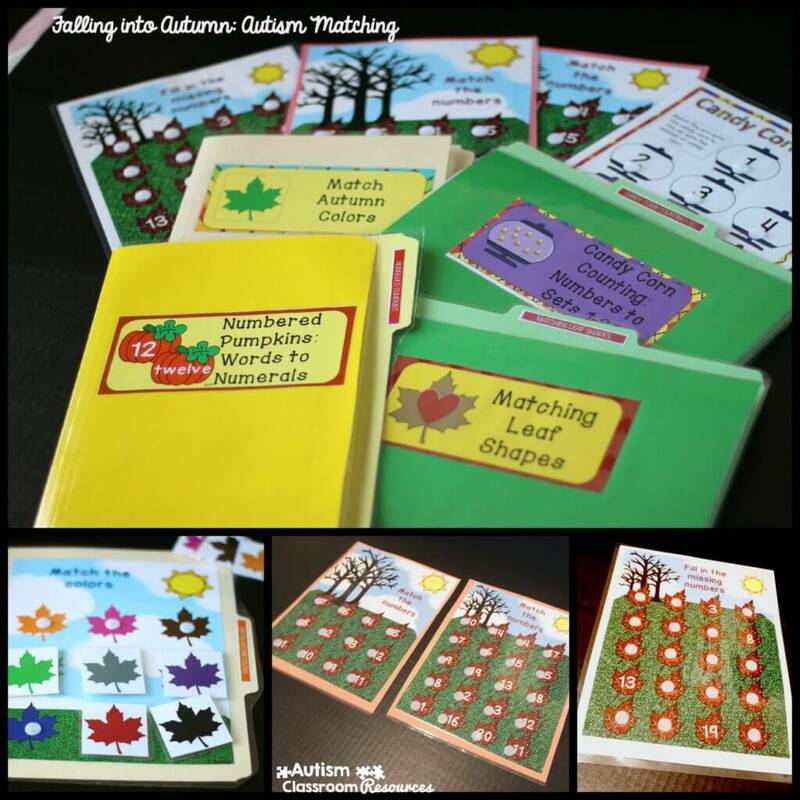 The Falling Into Autumn pack has file folders focusing on colors and shape matching, matching numerals, matching numerals, matching sets to numerals, and filling in sequences of numbers from 1-10 and 1-20. 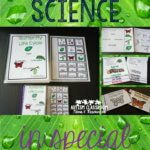 They are great for preschool through kindergarten but also for early elementary students in special education. I created them initially for use in structured work systems because they are easy to use once you get them made. You can use them in file folders or in binders. 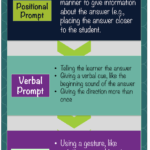 I also use them during instruction to give to a student while I attend to another one in a small group. They are great for that time I call table tasks that are the waiting times of the day. The time while you wait for all the kids to show up to the classroom first thing in the morning–these types of activities keep those little hands busy. You can see the leaf activities above the some of the pumpkin and candy corn activities below. Many of you may have seen my Fall Color Generalization Set. 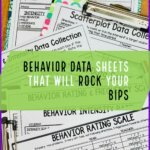 These are designed to generalize the skills that are covered in my Discrete Trials Colors unit (see the freebie sample for that here). 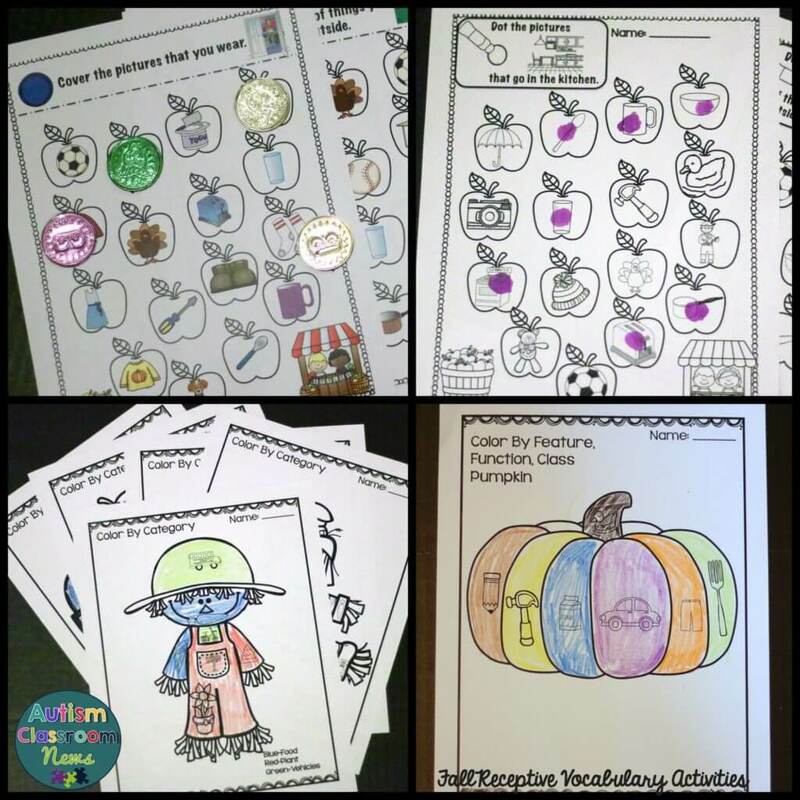 There are the five file folders you see in the picture including football, back to school with tablets and headphones, leaves and trees (of course), and of course pumpkins and turkeys. The file folders are great for work systems as well as the uses I talked about earlier. 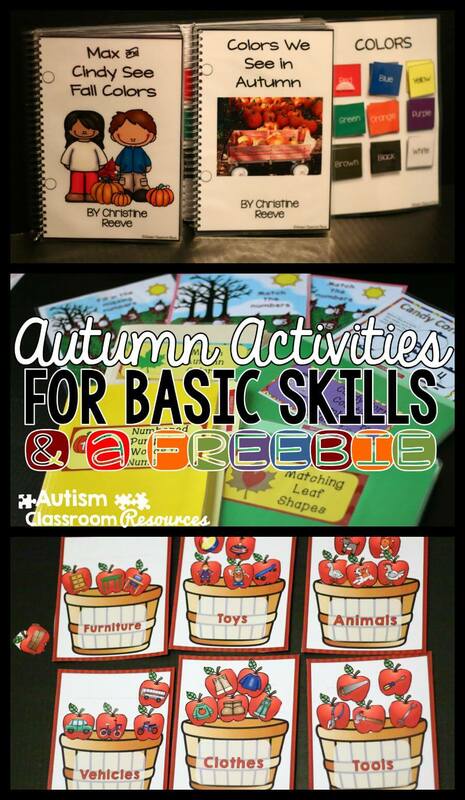 The interactive books below are included as well with clipart and photos for each topic (fall colors and back to school). I love interactive books and it seems many of you do too. I love using them for story time for younger children, for morning meeting for younger kids but also for our older students in special education. I use them to reinforce vocabulary and matching skills. 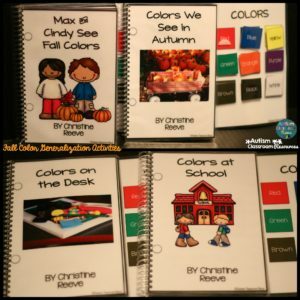 In these the students match a colored square to the colored picture, so they go a step beyond the file folders that match identical items to finding the color. You can also do the books backwards and put the colors in the story and have students take the color off and match it to the color square on the holding board that makes up the back of the book. I’ve found this works well for students who are not quite ready for matching nonidentical items. This way they match colored square to colored square but get a little variety. 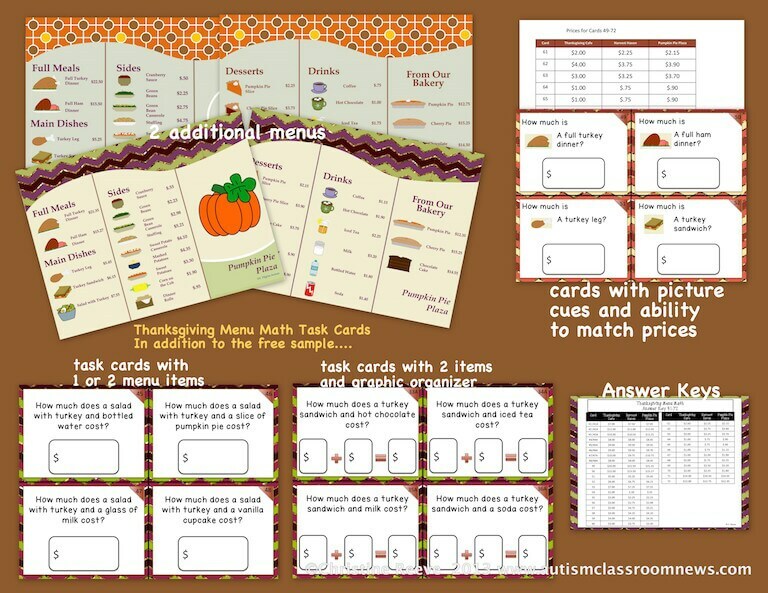 And I haven’t forgotten my secondary friends, My Thanksgiving Menu Math Task Cards are a set of tasks that I really need to create in a non-Thanksgiving theme. The students have to find prices and items on a Thanksgiving menu and determine prices. They have to locate the items and their prices. On some cards they have to add items’ prices together. I like the combination of functional literacy and math skills and have used them at other times of year. And, there is a freebie in the preview on TPT–so download that and try it out. And again the task cards make differentiation easy and these are great for work system as well as for direct instruction. I also included some re-usable activities in the set, as you see above. There is a file folder (or binder task) for finding the associated item (e.g., shoes for socks). And there is a set of sorting mats for sorting by category. 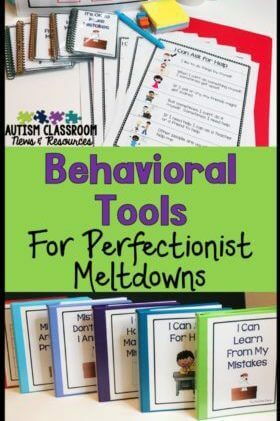 These can be laminated and put in binders, used as mats, or glued into file folders as you need them. 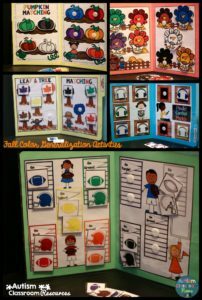 I like them set up this way because I can choose how many categories or which categories each student needs to work on. Add some Velcro to them and they are great activities for work systems as well. 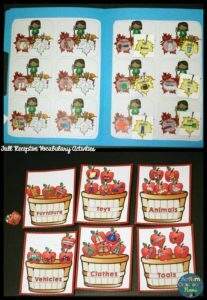 So, if you are interested in trying out some of the print and go activities from this pack, I created that has different versions of the worksheets that are not included in the paid product, so if you already have the product, download them to add them to your set. Just click the picture below to grab the freebie in my store. Finally if you are interested in any of the activities I’ve talked about today, just click on the pictures above to check them out in the store. I try to make my previews very detailed so you can see what it in each set, so be sure to download it. 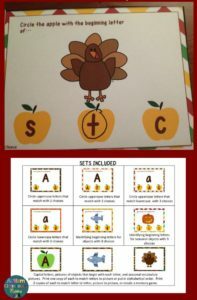 And don’t forget the Thanksgiving freebie I mentioned above as well. « How Can We Best Teach Reading to Students with Autism?